Golden Globe event attracted well-known celebrities from all around the world. 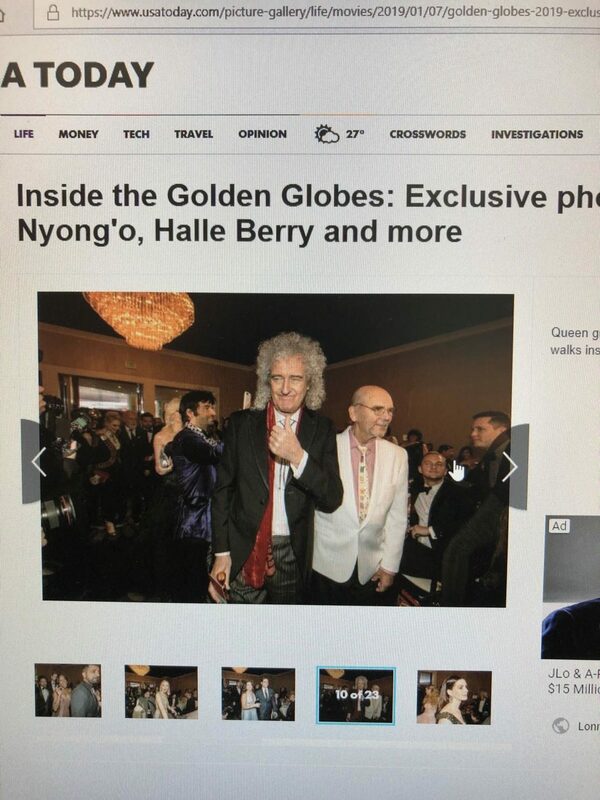 As the actors, actresses, musicians, and directors crowded the after party event, Queen guitarist Brian May gives a thumbs up to the camera and a dashing smile. Lights, camera, action–and a little bit of fashion! The 2019 Golden Globe Awards has people raving about the outfits, awards, and people. This year Sunday, January 6th, marked the 76th annual Golden Globe Awards. Many surprise awards and amazingly fashionable actors and actresses made a lasting impression on the cameras and on their fans. From directors to actors and actresses, many received awards they’ve deserved and greeted these awards with faces full of surprise. This extravagant event was located at the Beverly Hilton, in Beverly Hills, California. The hosts this year were Sandra Oh, who starred in Grey’s Anatomy,playing the role of Christina Yang, and Andy Samberg, voice for many characters such as Johnathan in Hotel Transylvania, and is the main character in Hot Rod. As Snapchats blow up phones over the fashion that was seen at the Golden Globes, you get an inside glimpse of how eccentric these actors and actresses can truly be. Lady Gaga was truly the “star” of the night in a custom Valentino Couture and Tiffany & Co. Jewelry. “Her outfit was by far the best, she even got her hair to match her dress!” Colby Hurt, junior at Lafayette High School, enthused. She starred in the motion picture A Star Is Born along with her co-star Bradley Cooper, who rocked an all-white tuxedo with a stand out black bow tie. Regina King also showed out in a custom Alberta Ferretti dress and Maison Messika Jewelry. Many fans raved about her beauty as she walked into the Golden Globes. Sandra Oh arrived in a white, one-shoulder Atelier Versace dress before she changed into a red Versace dress with a plunging V-neck that covered her shoulders and revealed a slit down the leg. “Sandra Oh really killed the game this year. She truly is my favorite actress,” said Erin McMullin, freshman at Virginia Tech. Taylor Swift stunted in an off-shoulder black sequin Atelier Versace dress and Emily Blunt rocked the red carpet in a high-collar sleeveless Alexander McQueen gown with cutout embroidery. John Krasinski, husband to Emily Blunt and looking as hot as ever, showed out in an all navy fit, starting with a navy Brunello Cucineli tux, navy Christian Louboutin shoe, navy IWC watch, and navy Montblanc cufflinks. Michael B. Jordan was dashing in a Burberry tuxedo, finished off with a Piaget watch and Cartier cufflinks. The star of motion picture Bohemian Rhapsody, Rami Malek, looked chic in his Givenchy tux paired with Cartier cufflinks. Awards were given, surprise faces were shown, and joy was spread. Bohemian Rhapsody won Best Drama, along with the main character Rami Malek who won Best Actor for Drama movie. “Bohemian Rhapsody definitely deserved the best drama movie award because it was truly an amazing movie to watch,” said Rachel Hughes, freshman at Liberty University. Green Book claimed and collected three wins: Best Comedy, Best Supporting actor, and Best Screenplay. The Assassination of Gianni Versace: American Crime Story was the lead in the TV category with four nominations. Actor Christian Bale took a victory as he won the nomination for Best Actor in a Motion Picture- Comedy or Musical. Actress Sandra Oh won the nomination for Best Actress- TV Drama for her character in Killing Eve.